The moment your lure sinks 8-10 feet below the water surface, it becomes very dark… The perfect time for you glow in the dark bait rigs. Then, everything comes to just how well you have chosen the type and color of your lure. With different colors, you get different travel distances and visibility of the bait; for instance, bright orange actually earns it the similarity to a grey shade when in the water and so on. In practice, though, selecting a glowing lure is not too complex, as we’ll show you below in a moment. The glow effect is highly enticing for predatory fish. Some anglers enhance their non-glowing baits with a bit of luminescent paint, and this alone might help you attract your game from greater distances. However, your lures also need to be realistic and natural looking for the always-so-careful finny prey. Fishing bait manufacturers use special soft materials and shape them accordingly to achieve a plausible imitation that will emulate fish movements both in the day and in the night. 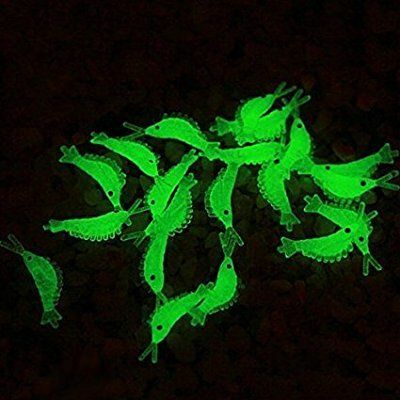 Described below are the best examples of glow in the dark fishing baits available commercially. The key to night fishing is the moves and vibrations your lure emits. These factors trigger the lateral line sensory cells along the fish’s body, on which it relies even more strongly than on its eyes. In complete darkness, a predatory species may strike even without being able to see their prey. Adding some luminescence into the mix, an angler further enhances their chances to get ones of the biggest strikes, as well as increasing the strike frequency. 1. TRUSCEND Bass and Trout Fishing Lures – Your All-Around Choice for Predators. JerkQueen offers fishing gear aimed at maximized versatility. With the Truscend lures, an angler receives an item designed for long casting, as well as a quick and rip-fall retrieve. The JerkQueen lures vibrate, twitch, buzz, and flash, creating a high-quality imitation irresistible for finny predators to fall for. This type of baits, similarly to minnow lures, triggers the natural instincts of preying fish, signaling them to strike. The Truscend sinks just as you’d expect it to, perfecting your techniques of deep-water fishing; it’s sealing is completely water-resistant and reliably protects the sensitive core. These JerkQueen lures allow you to fish day and night, in bad visibility conditions, and basins with various depth and salinity; models come chargeable and unchargeable on your choice. The Truscend can boast really good sinking properties. Being quite large (6 inches long), these lures are weighty; however, they sink ever so slowly, letting you control them better before reeling in. Such a balanced weight serves perfectly for shallow waters and alone earns the lures the status of technologically advanced. Of course, you might like to add some more weight for deep-water angling. Faulty light/buzz trigger in some models. Sometimes you may notice that your JerkQueen buzzes and lights up only when you pull it half out of the water, while they are supposed to work the other way round. A good idea would be to check upon purchase and ask for a replacement. Occasional issues with lighting up. 2. Glow Lion Green LED Underwater Night Fishing Light Lure – Best Durability for the Money. Glow Lion brings anglers the power of glowing lures with an emphasis on durability. The LED lights are easy to set up and very bright in the result. Their light feature holds up long enough for multiple casting and makes it in depths up to several hundred feet. This well-lit and reliable product does its job of attracting bass, bluegill, crappie, and half a dozen other fish; it is ideal for night fishing in lakes and streams. Anglers choose these for fishing out of a bass boat, fishing off of a houseboat or simply as a nice inexpensive gift to give to someone. The baits seem exactly as waterproof as advertised. Apparently, you can actually use them day in, day out without having them take up humidity and getting them ruined. To ensure further that they stay non-leaking, be extra careful reassembling them when you need to access the on/off strobe switch inside. Otherwise, they require only occasional disassembly to be cleaned and dried up for continuous use. While having a commendable brightness, the Glow Lion falls short of sinking as promised. It falls on top of the water and then sinks, illuminating the lower layers; however, it can hardly live up to the specified 2100 feet. There seems to be the risk of filling the lure with water if put below 200-300 feet. To handle depths as large as 2100 feet it would require an O-ring seal, which can’t be seen here. The internal light switch is not very comfortable. 3. JSHANMEI 10 Packs Luminous Shrimp Sabiki Bait Rigs – Low-Price Effective Performance. Inexpensive and simple in use, this Shrimp Sabiki by JSHANMEI provides a relatively good luminous simulation. As far as glittery artificial baits are concerned, shrimp-like soft bodies are highly attractive for greedy game, while the luminescent design makes them super noticeable. The silicone rigs swing and beat their tails, imitating swimming activity and being especially helpful at night. Their biomimetic principle is usable both in saltwater and freshwater environments for attracting all kinds of predators that stay active in the dark. Sabiki Bait Rigs accumulate the energy of sun rays, so make sure you give them enough time in the light to function effectively at night. As opposed to plastic rigs, this Sabiki can change and even welcomes modification. Initially, it comes as a multiple-unit bait with 5 shrimps each. However, its construction doesn’t prevent you from cutting it and knotting your own single rigs. Thanks to the detailed design, there comes a swivel and a pin with each shrimp for you to attach the lead and run through the line. A flexible connection like this one ensures protection of the fishing line from grazing and coiling. As inexpensive as they are, their snaps just won’t hold up. They are definitely not designed to serve you for years. They are replaceable all right; however, there is a chance you’ll feel JSHANMEI’s but hooks and line are somewhat inferior to those of other brands. Anyway, have spare parts at hand should their hooks decide to fall off. Not of very good quality. 4. OriGlam 5Pcs Night Fishing Lure Bait Kit – 5 Body Types in One Package. Lures and wobblers by OriGlam find perfect application in night fishing. Made of quality plastic and stainless steel, this package features five items capable of bright and continuous glowing. The lures are painted white with a clear varnishing that emits a greenish glow. Items in the kit differ in length from 2.75 inches to 3.54 inches, with a weight of 0.35 once for each one. The pieces bear two treble hooks on them to have a good hold on the finny prey. A slim elongated tail of the baits is designed to swing smoothly, luring the predators closer. These OriGlams accumulate solar energy to ensure a couple of hours of steady luminescence. The kit should surely be praised for its versatility. Starting from fishing in lakes, rivers, streams, and ponds and up to ocean beach, ocean rock, and ocean boat fishing, the lures feel to be just the right thing for the job. To stay useful everywhere, it puts a lot of emphasis on the sharpness of its hooks, thus ensuring high results with the most hard-fighting game. There seem to be minor differences in the brightness of each individual lure in the kit. The fact that these lures aren’t uniformly bright has few to none consequences for the performance. Nevertheless, seeing how some of your lures glow not as well as others is a bit disappointing. Some units may vary in luminescence. 5. QualyQualy Glow Fishing Jigs with Spoons Spinner Willow Blades – For Superb Fish Attraction. Now, with QualyQualy, you’re in for some unique features in the first place. The lead construction of the jig head gives an angler the necessary weight for a nice casting action; the willowleaf part adds characteristic, bite-attracting movements. Despite its tiny appearance, the jigs imitate baitfish pretty well, with 3D-eyes for an even more natural look. 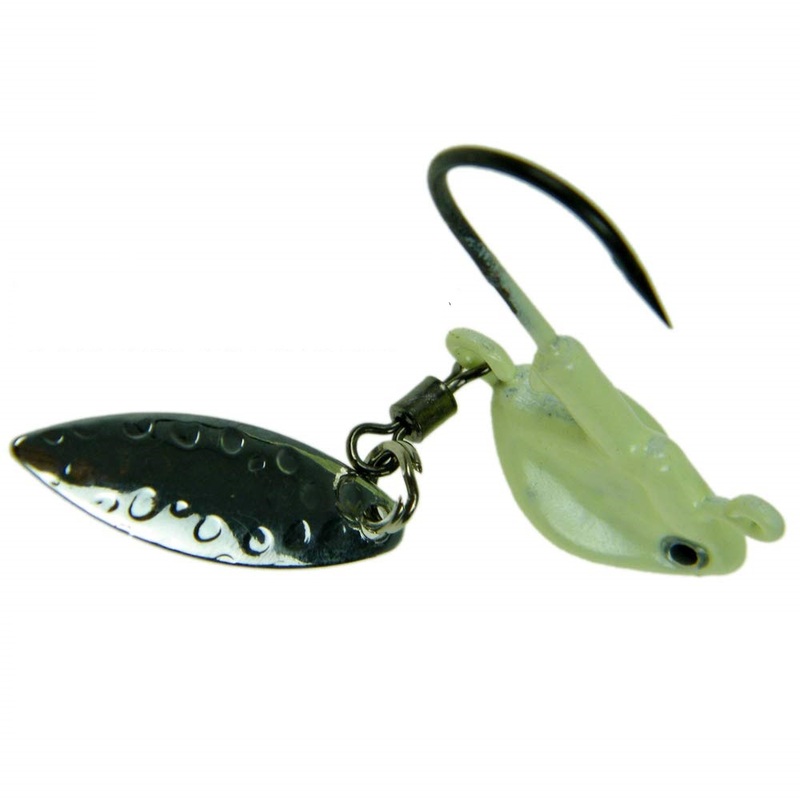 The manufacturer claims that this model combines the benefits of jig heads and spoons to provoke more frequent and stronger bites. These glowing heads of four sizes come attached to the blade spoons with rust-resistant rolling swivels. As for its singular hook, it’s big enough to be used for earthworms, shrimps, and other types of soft lures. Use the small bump to fix the lure in place with steel wire and prevent it from slipping off. We especially like the unique way these spinner spoons work. While being pulled through the water, the weighted jig head ensures an inclined mode of motion thanks to the displaced center of gravity. The rotating willowleaf blade creates appealing vibrations, while your preferable soft lure adds the attractive smell. A nice combination for high results, indeed. They won’t glow for longer than 15-20 minutes. Apparently, the luminescent layer is quite thin. Solutions? You can either use them taking turns and allowing the rest to charge a bit more or add another layer of phosphorescent paint on your own. Won’t glow for long in one go. 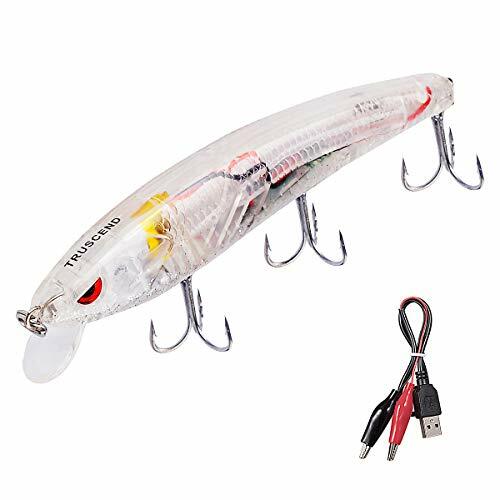 Fishing lures emitting light have become interesting to anglers due to their ability to improve performance during dark hours, including early morning and late evening, as well as fishing in dark waters. While also effective in freshwater basins, the glowing material is primarily selected to simulate the bioluminescence typical for many sea creatures, thus approaching the most natural look. Mostly, plastic resins are utilized, the types that can be blow-molded, injection-molded or extruded. Hard-bodied lures often come made from plastisol, styrenics, thermoplastic rubber, and polyolefin. Jelly-bodied lures, as a rule, use silicone and flexible rubbers. The end product’s quality depends on a valid combination of plastic ingredients and accurate molding/extruding. In view of this, it’s the manufacturing procedure that matters rather than the material itself; the plastic body of a lure tend to be durable when nicely made. Generally, well-recognized fishing gear brands employ better technologies to bring you baits that endure multiple re-uses. Furthermore, look for the quality of fluorescent paint and varnishing. Your bait shouldn’t shed paint, as well as its varnishing, shouldn’t have chips/cracks and come off when you, say, rub it with a sleeve. Many modern models also have realistic convex 3D-eyes on them, which should be glued on firmly. Your bait rig may also feature a rattle chamber for acoustic extra attraction. There are two types of chargeable lures. On one hand, older anglers have seen the evolution of glow additives that get charged or energized after being exposed to UV light. On the other hand, today’s favorites are battery-powered lures. Luminous baits from the past were less bright, less wear-resistant and not so good at holding the charge. 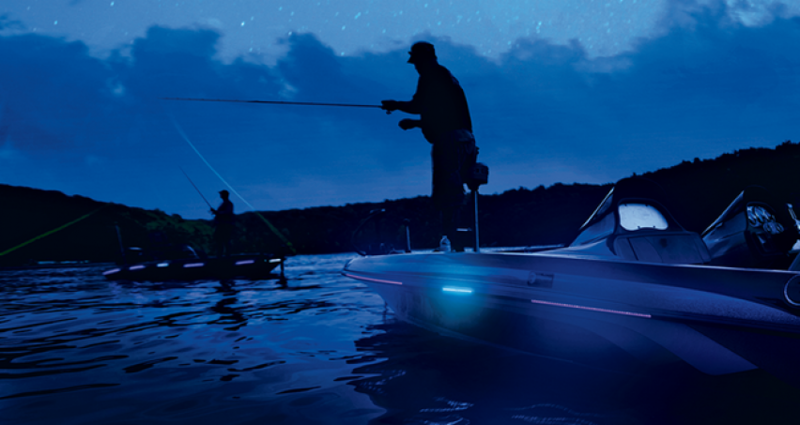 The modern fishing gear market offers lots of high-tech solutions with a wide spectrum of glow colors (read below on how the color matters). Most sources of UV light, including sunlight, fluorescent light, or a black light, will help you charge these models. 2-5 minutes are enough for the lure to keep glowing for up to 8 hours in complete darkness. At the same time, your lure will absorb energy on itself when you’re chasing fish in sunlight. It simply gets enough UV rays for those 10-15 seconds you have it in higher water layers and outside when retrieving. The duration of the luminescent effect varies, depending mostly on the content of the luminous pigment (phosphor). To achieve the best effect, manufacturers paint the glowing substance over the white substrate of the lure body. In this way, the highly reflective white surface increases the resulting brightness of the transparent paint/varnish. Battery-powered bait rigs contain either a proprietary lithium-ion or a standard AA; you can charge these with a brand battery charger (if included), via USB or a lighter socket adapter. Usually, these models last for 3-4 hours, going up to 12 hours with 150 minutes of charging in the case of Truscend. In addition to LED-lights, they have a motion-generating module allowing them to twitch, vibrate, and buzz. Some models also can even emit sounds (clicking, rattling or chugging). Their water-sensing switch turns the power on/off automatically when the lure sinks or comes out of the water. Manually operated magnetic latches give the angler a chance to turn the light/motion module on and off externally. While providing a fisherman with an effective tool for both shore and boat fishing, the bait’s internal circuits need to be watertight to function. Check if the rubber plug on your model’s charging port sits nicely in and is flush with the surface to not end up torn off by a predator’s teeth. 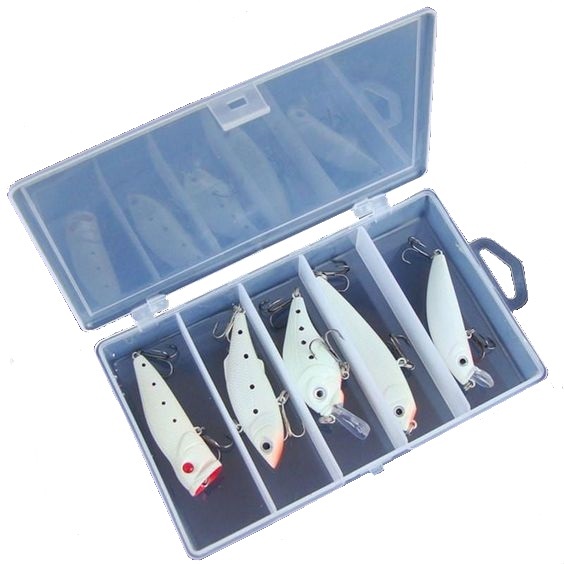 Wobblers and trolling rigs can have different colors, as well as containing various amount of paint. In fact, there is no need for the entire bait to glow as too much brightness may only scare the game off. That is why you’ll often see nothing more than just luminescent strips and points painted on the imitation. The color itself determines how far your rig/wobbler can be seen underwater. Blue travels farthest of all, with green, yellow, orange, and red following it in a decreasing order. Silver or golden flash elements are also very effective for fast-moving, wobbling baits. UV-charged lures provide the optimal performance for surface saltwater fishing. If you don’t plan to go deeper than 25 feet, you might expect coho and sockeye to be your frequent guests. The latter refers to dine, mostly, on crustaceans and krill – and that’s exactly where the Sabiki Shrimps may come in handy. 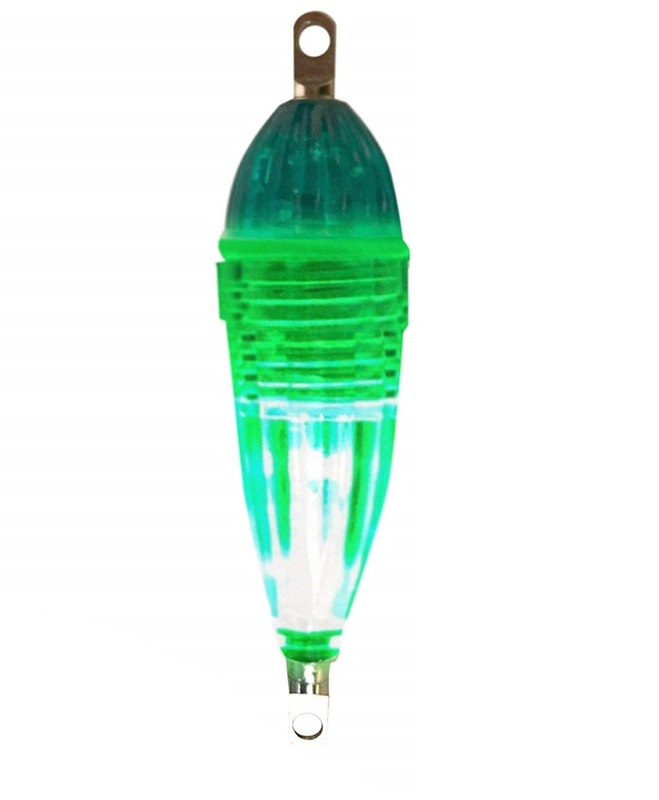 Green glow in the dark lures are the most widespread as they allegedly provide the best bite. While green luminescence, indeed, occurs in aquatic creatures more often, this does not render other colors useless. Due to morphological diversity within fish species, each individual fish has its own glow perception, so there are no hard and fast rules here. One day, you can actually find out that red or blue models work better for your fishing place and style. Glow Ghost wobblers are recommended for use when you need a bait with the most contrast relative to the lake’s bottom and weeds. This type allows you to catch fish in complete darkness, especially pikeperch and bass. The wobblers feature convex eyes and float rather well due to the rattle chamber inside; their optimal working depth is up to 7 feet. In daylight, the ghost wobblers look like a glowing albino fish; in darker hours and muddy waters, an angler gets to appreciate the full benefit of luminescence. Glow Soft worms/shrimps are ideal for jigging in the nighttime. They find use in both freshwater and saltwater. Normally, these rigs come in packages/kits. Their glow color varies from greenish to bluish hues; rarely get larger than 5 inches. Glow Grubs are a finer version of glow soft worms that usually doesn’t exceed 2 inches. They, too, are sold in packages of 10. They will help you optimize your jigging technique for bass, pikeperch, and crappie. These models also suit finesse fishing. Glow Spinning Jigs are made of steel or hard plastic. 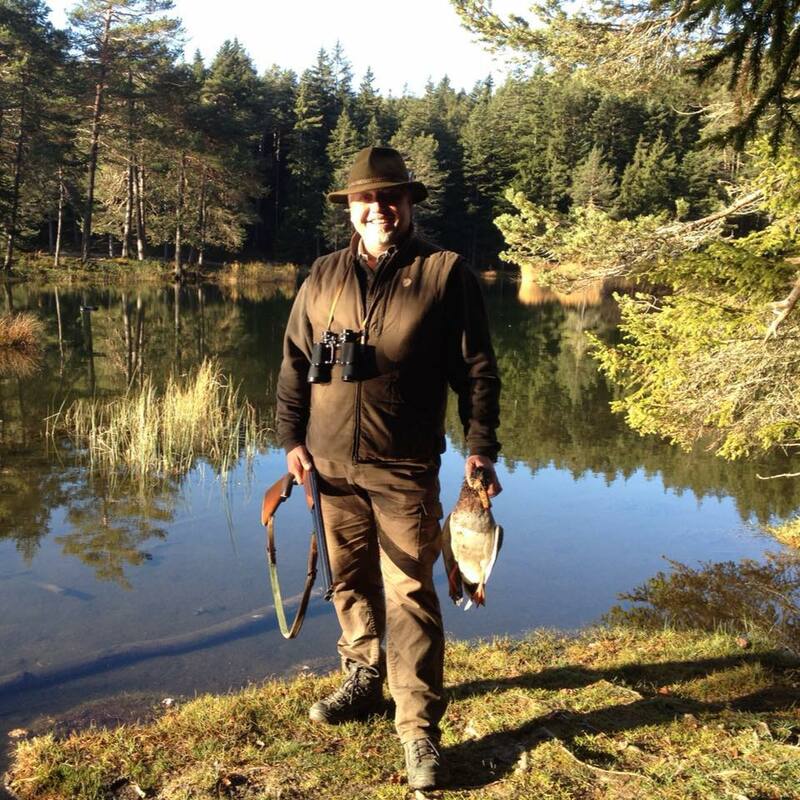 Their specific movement in the water occurs thanks to willowleaf spinner blades. The main bait body consists of softer plastic or silicone with glowing additives. Many anglers prefer glowing lures due to their enticing power to pikeperch. This crepuscular species lies still on the bottom during the day and comes out en masse at night to forage in shallow waters. It especially fancies small fry, and glow in the dark lures attracts it more than anything else. Using glowing fishing lures at night and in muddy waters also makes them more visible for pike, salmon, trout, and bass. The dark times are particularly good for trout and grayling. Being very cautious, these fish gives daylight anglers a hard time because they simply won’t buy it if there are slight insufficiencies in your bait’s camouflage. Having a set of differently colored glow lures is helpful in case you don’t know the preferable depth of your prey. For instance, in the Lake Victoria waters, several species, such as coho, sockeye, and pink started feeding deeper, down to 110 feet. When any fish species changes its preferable depth, its glow/movement perception becomes influenced by the water column in a different way. Specifically in said case, with less light and a shifted spectrum, these high flyers start reacting much better to bait rigs with a red component. Glow baits have found popular use in jiggling and fly-fishing. With imitations that range from butterflies, grasshoppers, flies, snails, shrimps, to green and white woodworms and baitfish, the angler gets an opportunity to attract finny predators with bright colors typical for the creatures of the area. Luminous paint has been known to increase catches for many years. Today’s night fishermen get an even greater edge thanks to the full-on audio and visual imitations. You indeed can take it to the maximum with quality glow in the dark lures!